Hanan is a 45-year-old Jordanian woman who sells hand woven goods to earn supplemental income to support her 18-year-old son. This is a worthy achievement in its own right, made that much more notable when considering that Hanan lost her sight when she was just 28 years-old. 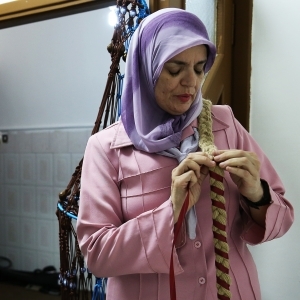 In recent years, Hanan has pursued a new chapter and become a skilled weaver. And with NEF’s assistance, she turned what was once a hobby into a way to generate income. Hanan shared that it boosted her morale greatly when she learned that there was an organization interested in helping people like her, with disabilities. Of the training, she explained, “The trainer was so good and had an easy training methodology, and NEF’s team also had a good way of communicating with me. Therefore, I continued the training and the trainer explained everything to me and there were a lot of women participating, so it felt real and not like just a hobby.” With the knowledge she gained from NEF-led trainings, and the project grant she was awarded, Hanan purchased materials she needed and started getting her products in front of new customers at trade shows, public markets, and community association activities. NEF’s work in Jordan is funded by the U.S. State Department’s Bureau of Population, Refugees, and Migration (BPRM) and City & Guilds. Click here to learn more about NEF’s work in Jordan. Inclusive Livelihoods Development: Hanan from Near East Foundation on Vimeo.